Answer Jury Summons By Declaring You Would Rather Count the Wrinkles on Your Dog's Balls Than Serve on a Jury. Moving right along, here's my number 6. Police in New York reported that a 40-year-old man reporting for jury duty at Brooklyn Supreme Court was arrested after he tried to pass through security with a 30-inch sword and a 6-inch dagger. The sword was part of one of those sword canes that is so totally cool that if you ever had to use a cane, you'd absolutely want it to have a sword in it, but is also the kind that you shouldn't take to jury duty. It was not clear whether the dagger was part of the set, like this totally awesome dual-blade sword-and-dagger cane set that would completely rock someone's world, or was just a dagger. 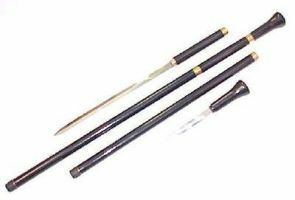 The chief of courthouse security, Maj. Luz Bryan, said that his officers spotted the sword cane right away because it "had two metal bands" around it, an "indication that something is concealed." (Note to self: if disabled, do not get cane with metal bands, sword or no sword.) They detained the man, who pleaded ignorance. "He kept saying that he didn't know [bringing a sword to the courthouse] was illegal," Bryan said. Turns out it is.